Drop in session between 11am - 1pm. Bookings will be confirmed on a first come first served basis once payment has been made. 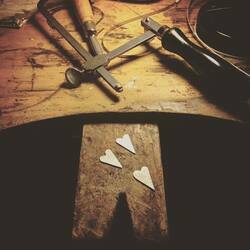 Join Silversmith Sophie Piddock in her studio for a drop in taster session and personalise a pre cut silver pendant. Participants need to bring own apron to protect clothes.